Well, got everything into the Personal Malden. Here’s my current layout and I actually had my Spiraldex come in super handy for recording some lost/fugue time. Front inside zip pocket. A pencil and a multi pen. Front inside pocket, my ADA cards for my service dog Linus. I need to get new ones because he’s older now but I’ll probably wait until I have my proof of public access test completion. Even though he’s been working for awhile, I always feel better about taking the “in training” off after the CGC and PSDS are done and I have full records of them. 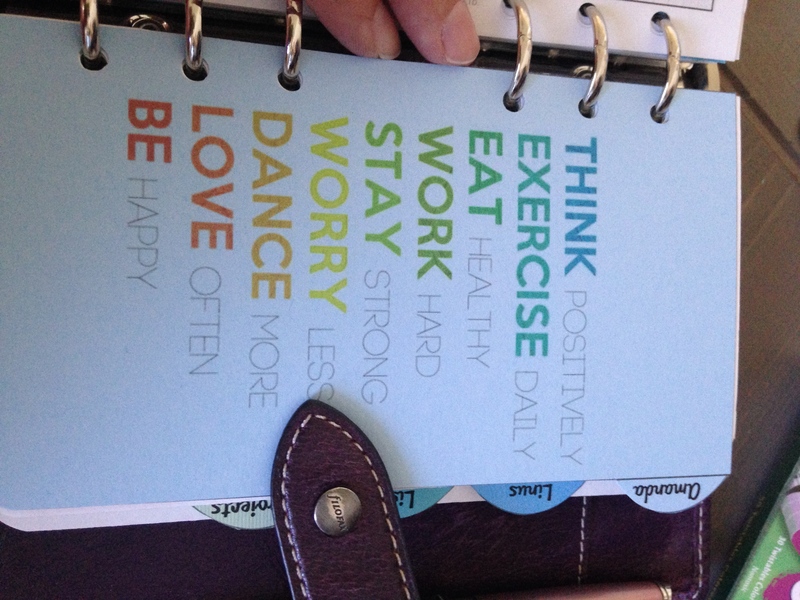 My front FIlofax clear pocket. The front has a picture of my favorite beach at sunset and the words to a song by Susan Reed. I like it especially because at this point in my disability journey, I’m really trying to figure out where I fit in the world. These lyrics help me on not-so-great days. 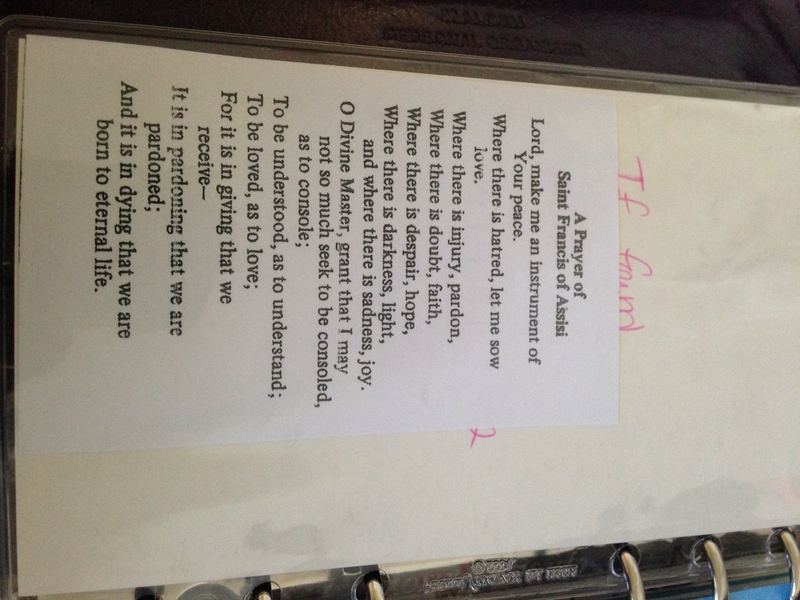 The back of the pocket has my “if found” info and The Prayer of Saint Francis of Assisi, another something I cherish. 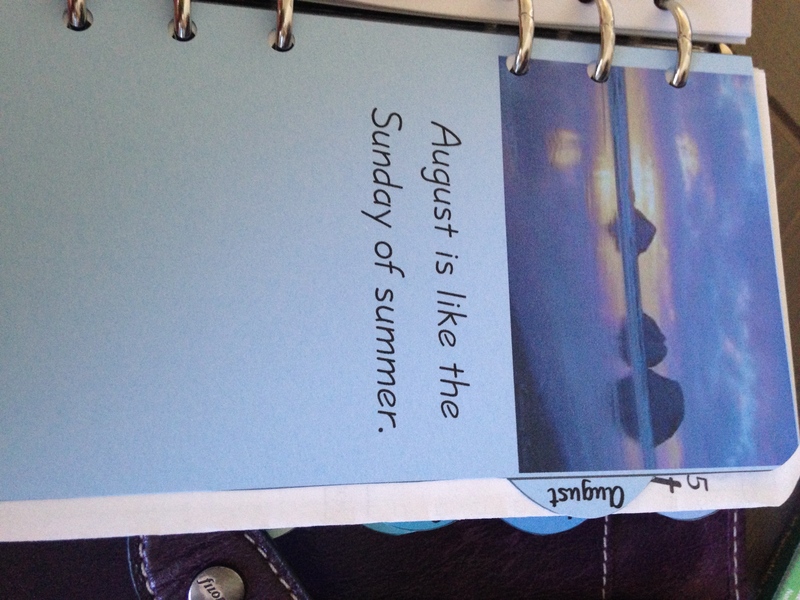 I have an index tab for July with a seasonal photo and an uplifting quote. A currently blank “Contents” page. Then I have my monthly foldout for July. 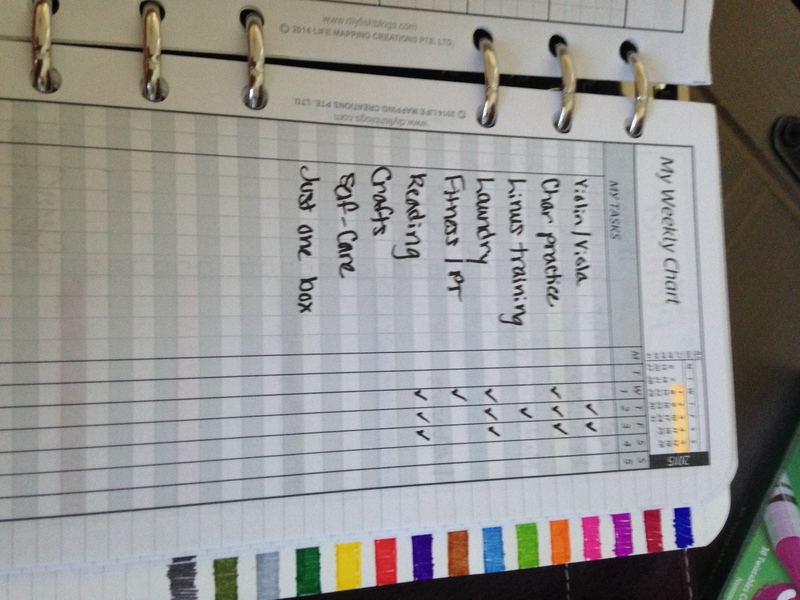 On My Monthly Chart, I’ve outlined the boxes for tasks that have a due date. When completed, I put a check in the box (example: Sunny Adequan). If they are not associated with a due date but should be done regularly, I put a check in the date box when it gets done so that when I look back thinking, “when did I last change my CPAP filter?” I can tell. 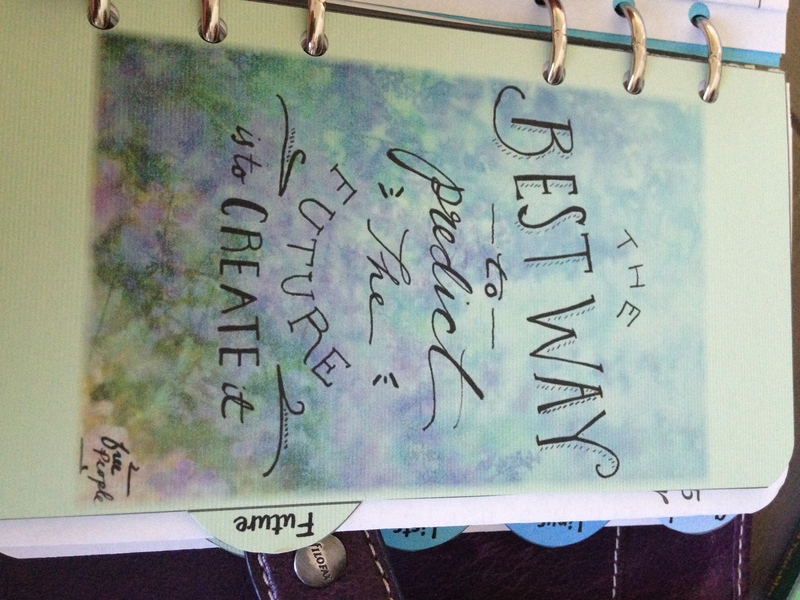 Inside the fold, I have my list of things I would really like to get done this month. These are in “My Objectives” list. 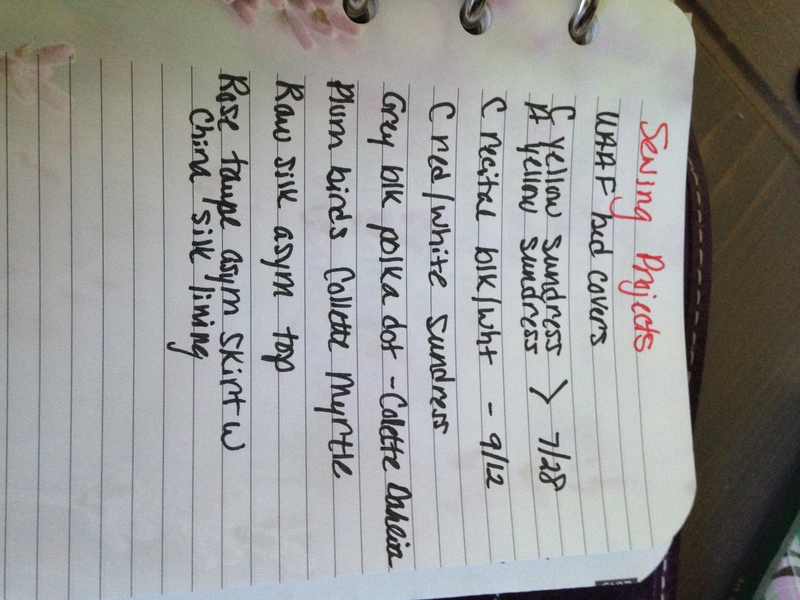 It continued down into the notes section because I had a number of things I needed to list. The next foldout is for Week 27 (the current week). On the front I have a blank Weekly Review (nothing to add yet) and under Notes I have the book I’m currently reading and the pieces I’m learning in violin and viola. This is more for my own remembrance later on when I’m looking back through pages. 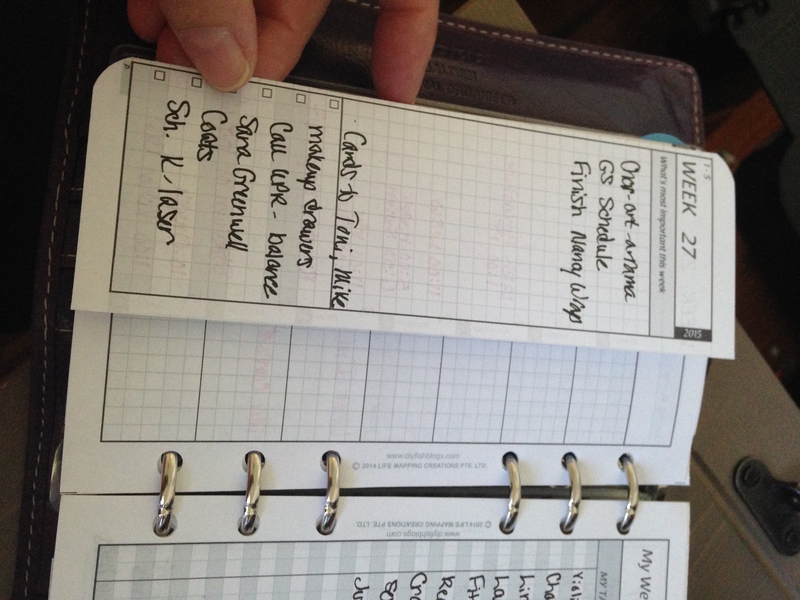 My Week 27 tasks divided into “gotta do” (What’s Most Important This Week) and “wanna do” (check boxes). 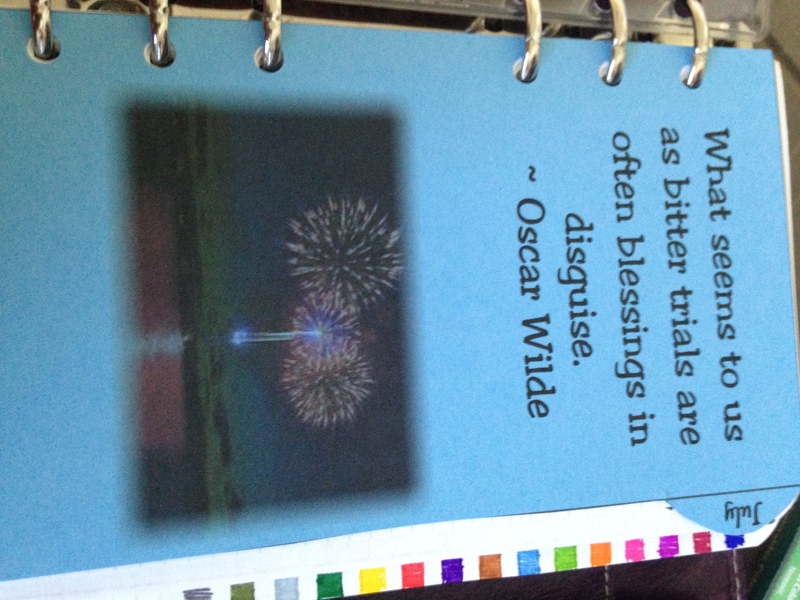 Flip side of the weekly fold is my “at a glance” calendar for the week. This tells me in a quick look where I need to be and when I need to be there. With my memory issues, I tend to need this little foldout section many, many, many times per day so I’m very happy that Fish has it fold out the way it does so it’s visible even when I’m working on a daily thing or a project page or something. The section to the right of that is for details pertaining to the appointments that I will need to transfer to daily pages at some point. There weren’t any of those for Week 27. The next page is My Weekly Chart. 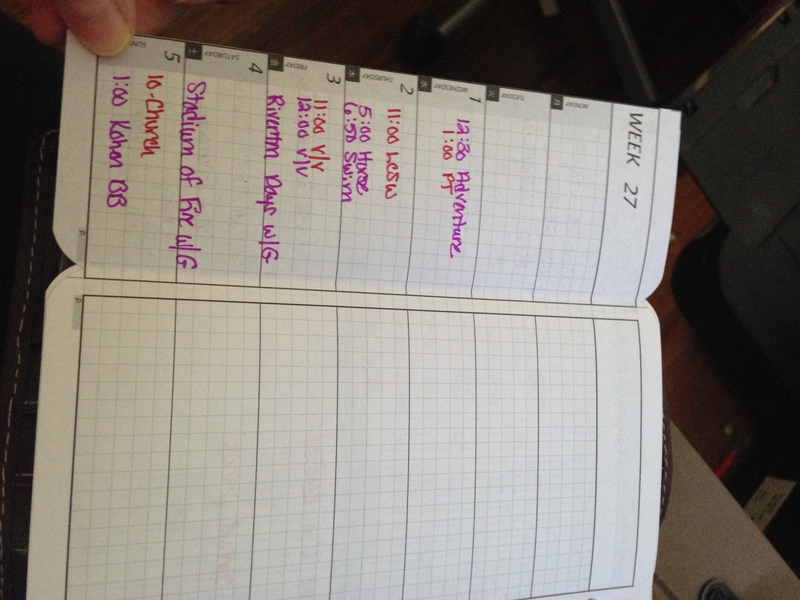 I highlighted the week just as a visual aid. Below that I have the list of things that repeat throughout the week that if I don’t check them off every day or at least a couple of days that week, I know I’m going to fall behind or not feel great. As you can see, I still really need to work on the Self-Care section of tasks. I’m terrible at that and it catches up to me when I don’t do it. So I can immediately see that it needs work. That’s why I list these, so it doesn’t get too far away from me and I end up in a pit of despair trying to figure out where I lost it. Flip side of that is the colorful Planner page that I’m kinda sorta using for menu planning but it’s just “meh” right now. A basic daily page. I didn’t see any quotes that knocked my socks off that day so there isn’t anything in the upper left. 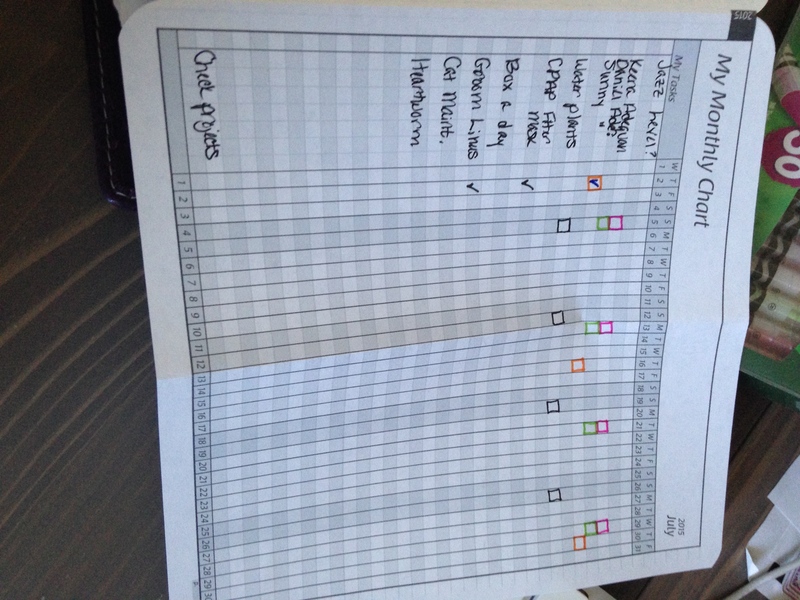 I had some tasks and some appointments but I did not track my water/caffeinated beverages that day. 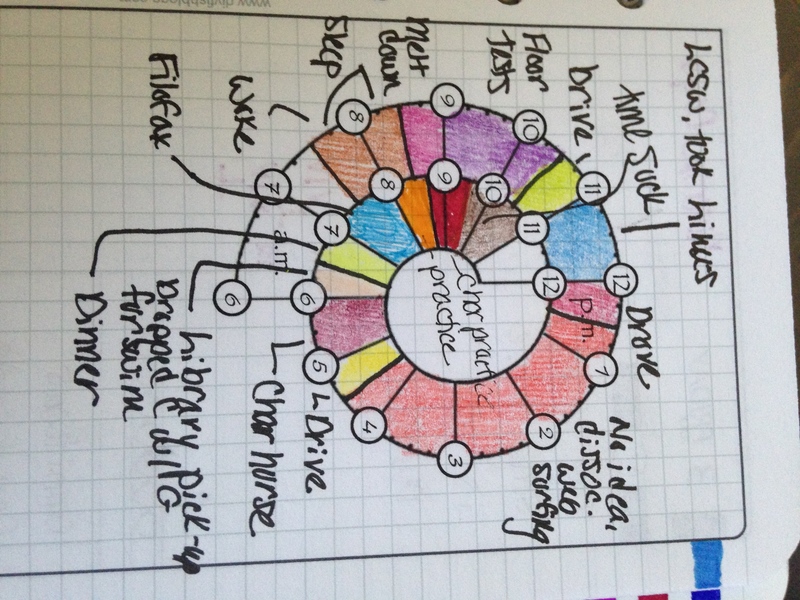 I usually color in water in blue and caffeinated beverages (coffee, tea, diet soda) in brown. You’ll see why this is so scant looking when I get to the next page. So here is a great example of why I use a Spiraldex. I woke up but had a terrible headache and fell back asleep. When I woke up again, I had an emotional meltdown. The fireworks around here in Utah are excessive, disturbing, and completely screw with my sleep and mental state. 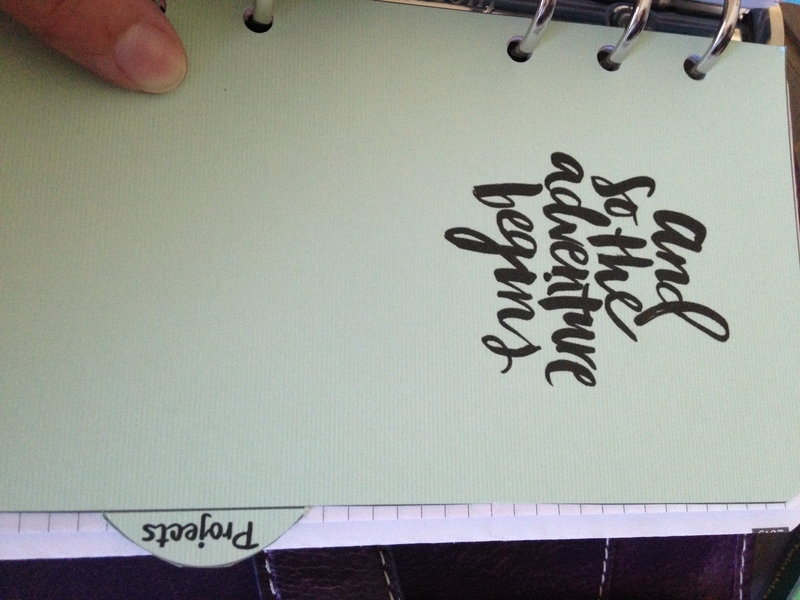 I have a section on here where I took Linus somewhere specific with me so I have that recorded and on the right margin of the page I have a grid section color coded for “Linus”. This might come in handy someday if I have to document his field trips, training sessions, etc. Then the big red section. I lost four hours to who knows what. This is called a “fugue” or “dissociative state” with my disability. It doesn’t mean that I wandered around lost or anything but it is a definite sign of significant stress that I sat in front of my computer for four hours and didn’t have anything to show for it. 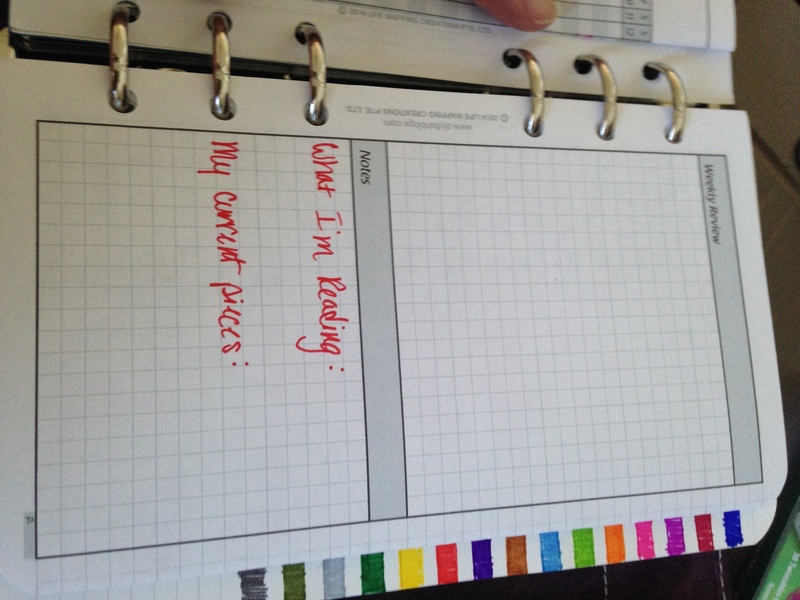 So it is also has a colored grid on the right margin so that I can keep track of it. If those periods start to accumulate, I’ll need to figure out what’s going on and get on top of it with the help of my medical team. See? This is exactly why I use a Spiraldex! 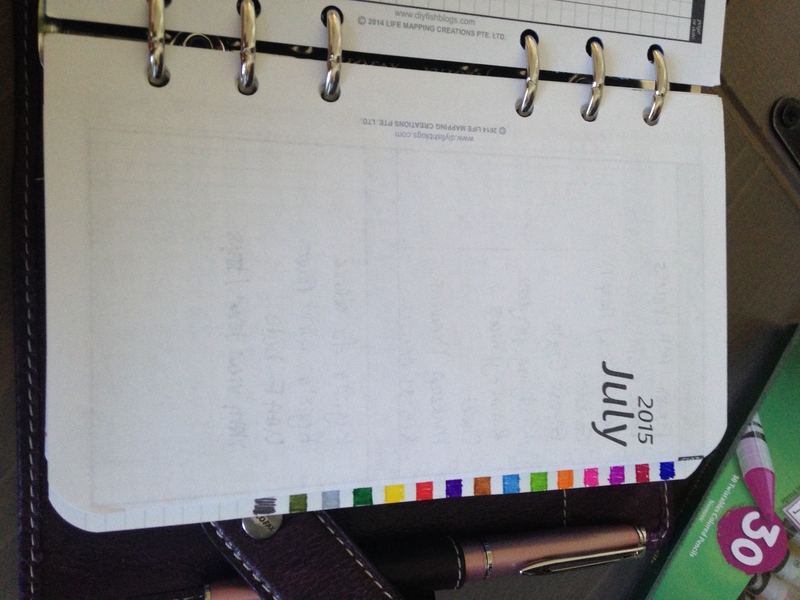 Here’s my color code index tab. 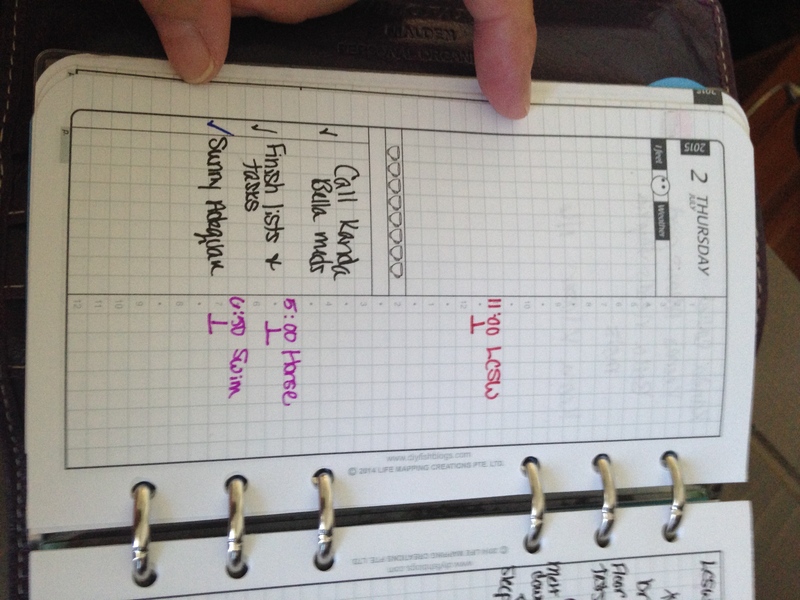 I cut it about one margin width wider than the usual page so that it sticks out just a bit behind my daily pages for the week. I have a color for every being that I need to record things for, people and pets. I have colors for dedicated project time, major events I may want to look up later. I used this to record when my daughter and I saw the Aurora Borealis. I have a color for correspondence so that I can recall when I sent a letter to somebody, and a color for lost time, which is the fugue or dissociative state that I talked about above. 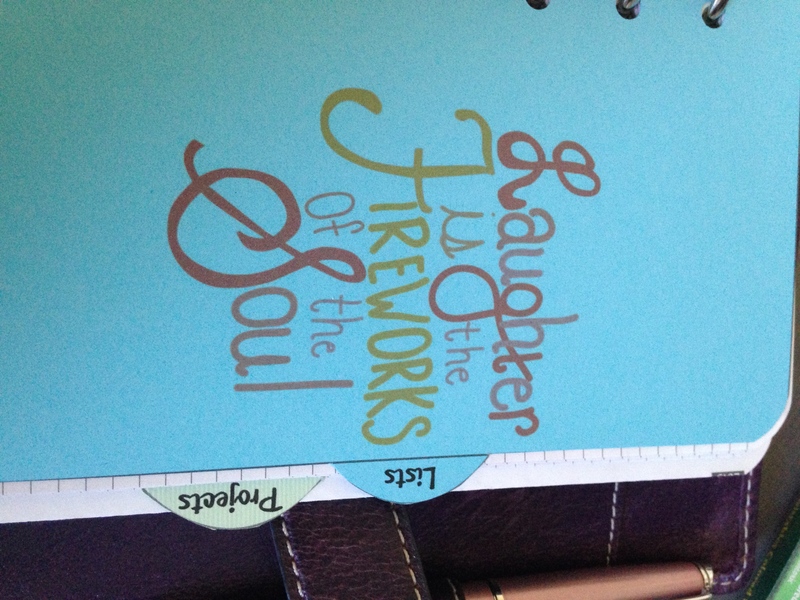 I have the rest of my weekly foldouts and daily pages for July and then I have a tab for August. For the month following the current month, in this instance August, I only have the weekly foldouts. I’ll add the dailies and transfer information to them when August gets here. One thing to note about my tabs is that I plan to move them into my archive binder so that I can find sections more easily. I’ll make new tabs for October and afterward when it gets closer. Future tab. Behind this I have only the monthly foldouts for October through December. I figure I don’t need to include weeks or days until those months are closer. Basically as I archive one month out, I’ll add one month to Malden. Here’s an example of a future month foldout. I know we are all due for eye exams sometime in December so I have that on my task list for December because I know I’ll need to make those appointments early that month. 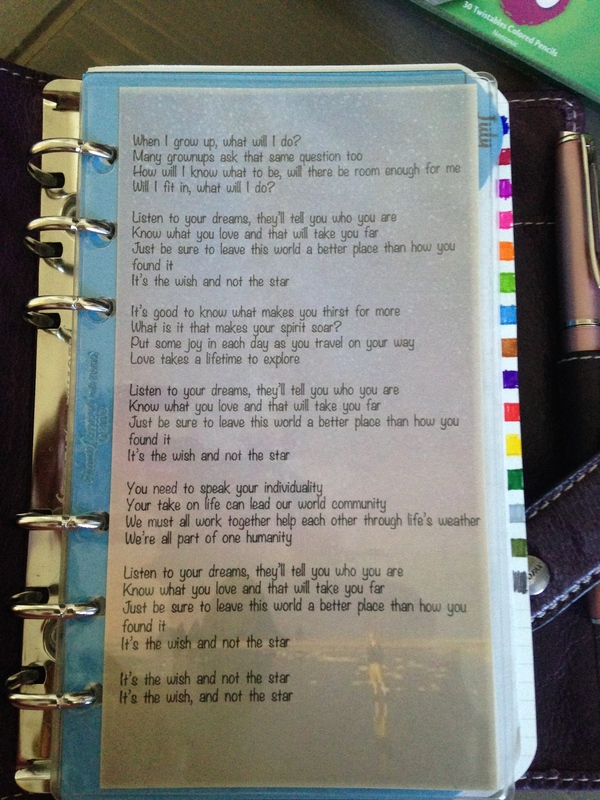 In the future section I also have the 3 year calendar 2015-2017 but don’t have anything on it yet. I have a tab for my personal stuff tracking. I chose this .jpg because these really are things that I know I need to do regularly to feel well and whole. 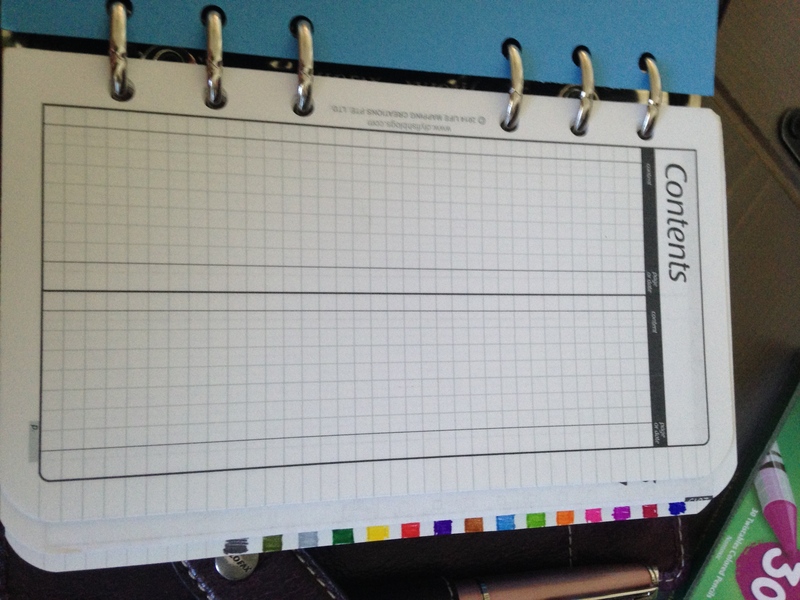 In here I have monthly foldouts for several things I want or need to track. 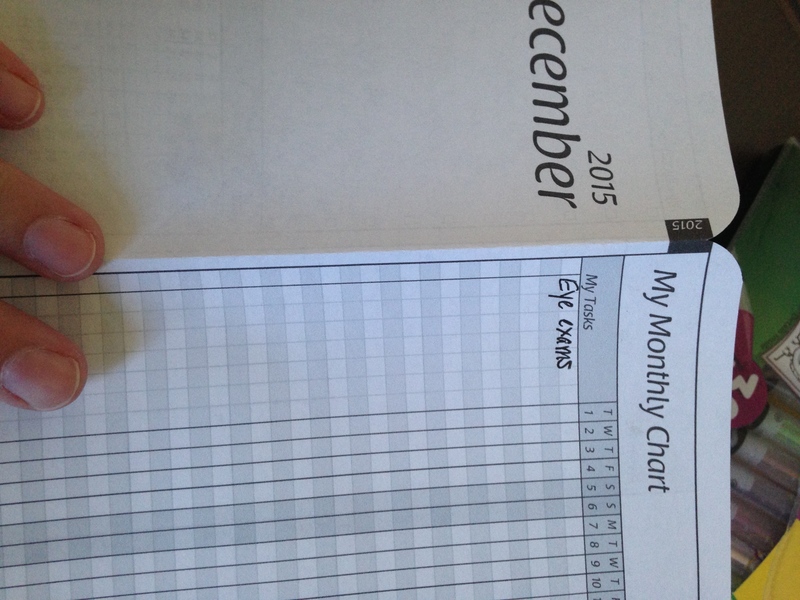 For these I just printed page one of the monthly foldout .pdf and use it as a spreadsheet. This one is for tracking workout stuff. I like to alternate things based on my physical therapy days so I like to be able to check what I did when. So, for example, if I check off that I had a full PT session on a Monday, which I know focuses completely on shoulder recovery and back, then on Tuesday I need to do something different, like ballet or core or lower body stuff. That way I don’t overstress the internal sutures in my shoulder. I just have the types of activities colored in to make it easier to see when I’m looking to work on a certain thing. 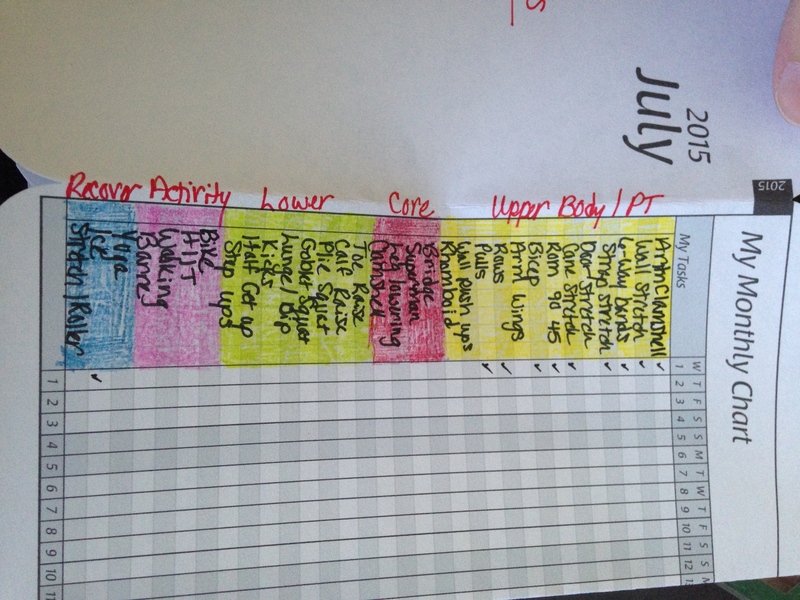 I also have a sheet for tracking weight, blood glucose, and sleep in a similar way. I track these three things on the same chart because with my disability, there is a direct correlation between them. If I don’t sleep or have lots of flashbacks, I wake up with elevated fasting blood sugar because I don’t go through that recovery period when the stress hormones settle down at night and your body recovers. If I do sleep well, my blood sugar is normal in the morning. Same thing with weight. If I have long periods of crappy sleep, my weight goes up. Tracking these things together helps me monitor overall if my stress hormones are getting out of whack. 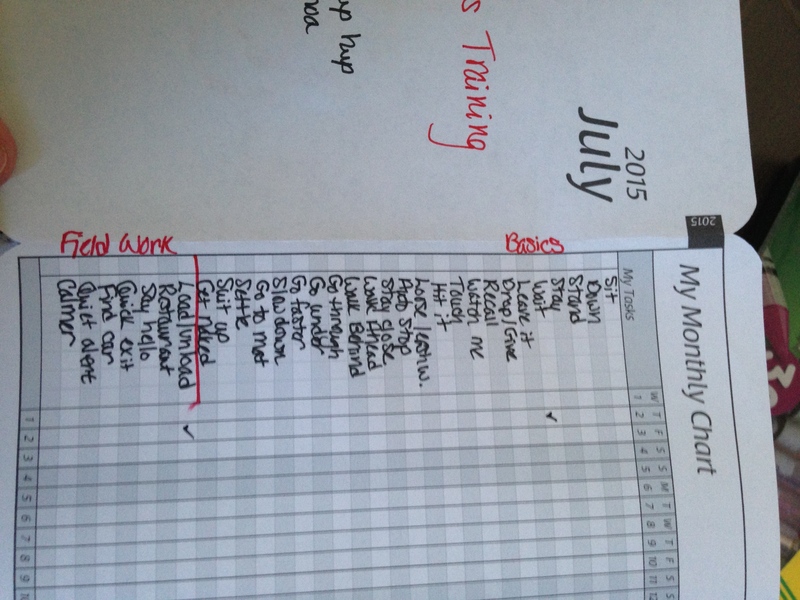 Here’s where I keep track of training activities and field trips for my puppy, Linus. 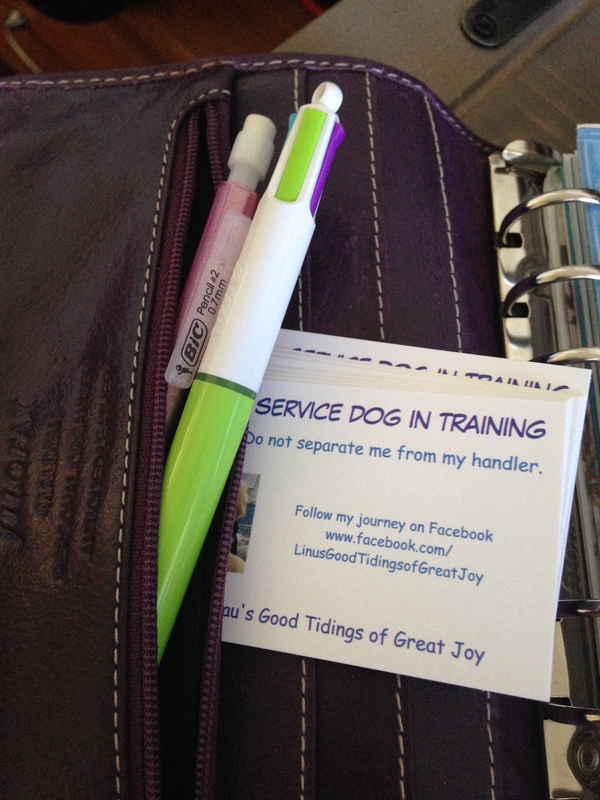 Because he is a handler-trained service dog, I have to keep good records of what we do when for training. Previously I had a notebook of all his stuff in it but it’s a huge pain to carry that around and half the time I would forget what we worked on during a certain session. 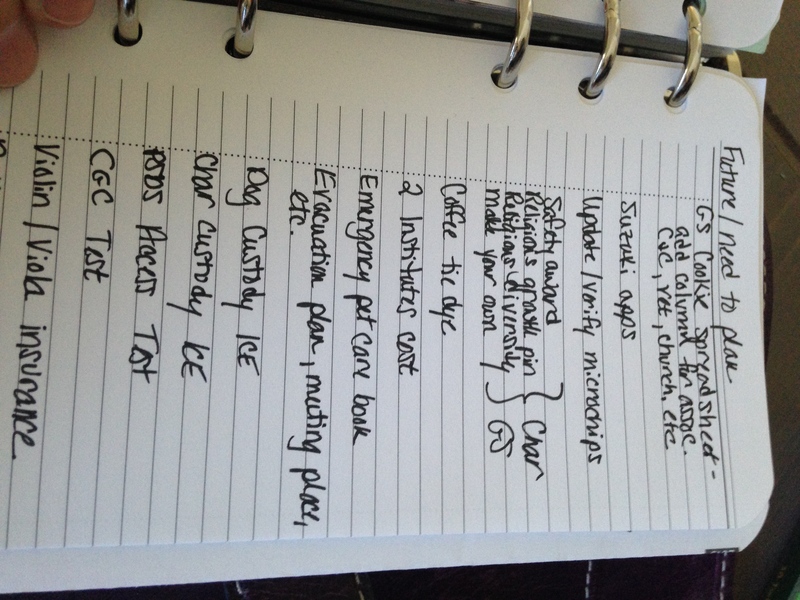 This is easier because I always have my Filofax with me and when we go on outings, I can just jot down what we worked on. 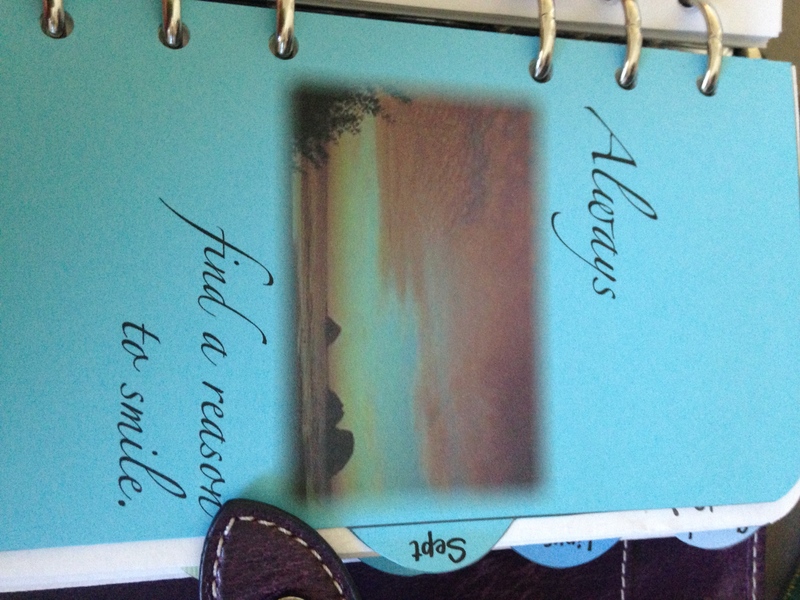 I can add details on my daily pages of specific locations or unusual circumstances. I have this section divided into “Basics” which are basic obedience commands and tasks; and “Field Work” which are tasks and commands specific to traveling around. One example is “quick exit” which we can really only practice on a field trip. That’s where he gets me the eff out of dodge when I’m overloading or having an anxiety attack that I can’t get control of. 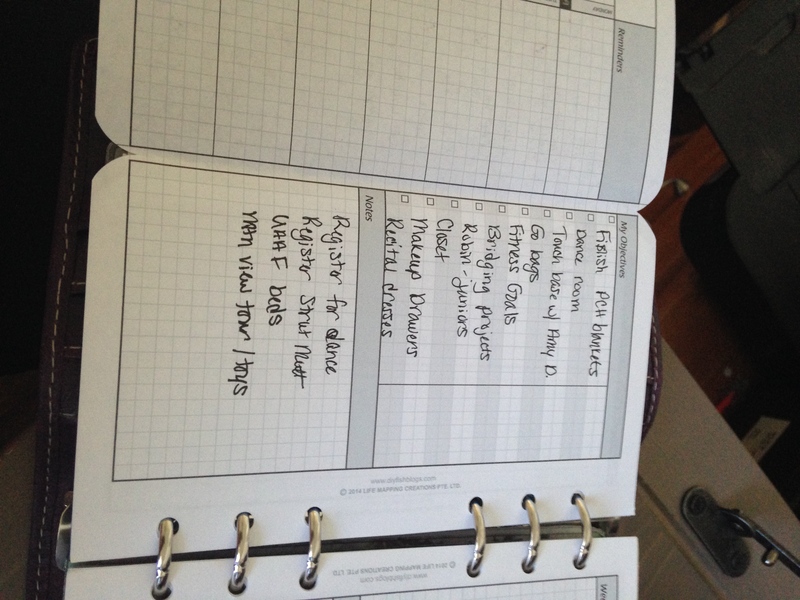 This sheet definitely changes from month to month depending on what tasks we’re reviewing versus learning new tasks. Some things he just needs to brush up on from time to time and other things, like “find the car” will take several months to fully get command of. This month has a list of all the basics from sit to more complex stuff just because I was off with surgery for so long that this is a good time to go over all the basics again, especially while in the field where the stimulus is completely different for both of us than it is inside our house. Next tab and section is “lists”. 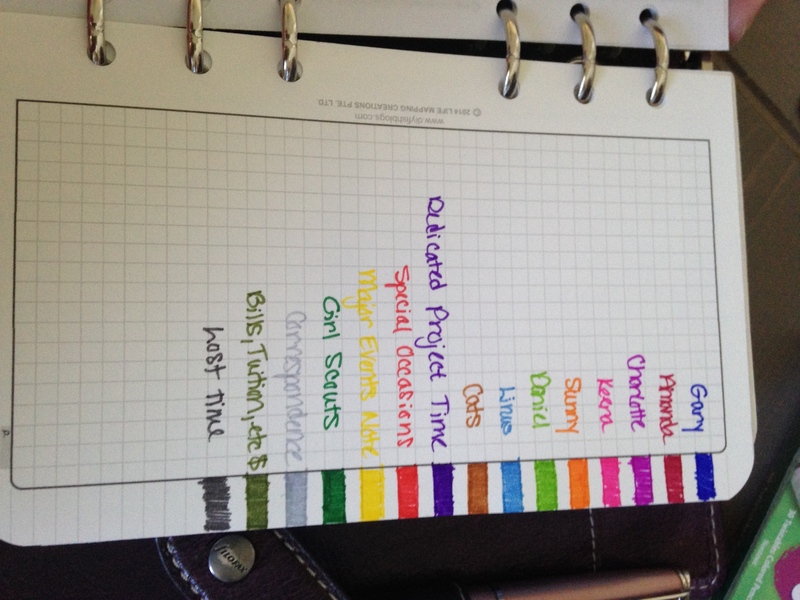 Stuff like favorite authors, books I want to read, refills for pens that I like so I don’t buy the wrong ones again, etc. 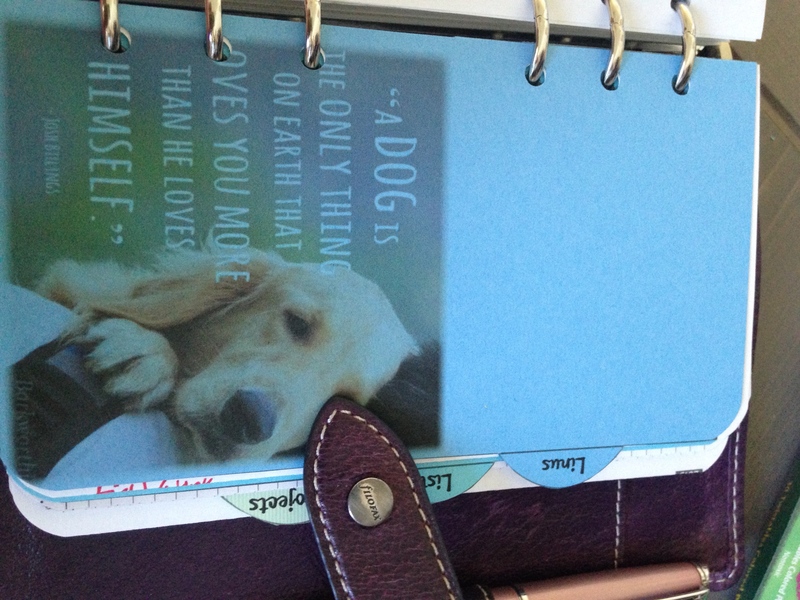 The final tab in my Filofax is “Projects”. Right now this is just a list of stuff that needs to get scheduled or broken down from Projects into manageable tasks. Full fledged projects will eventually go onto a monthly chart like my fitness and Linus’s training but I’m not there yet. I still have some brain dumping to do and I want to write a post about how I’m learning to turn a brain dump into projects and tasks with dependency arranged. That’s something I really struggle with and I figure others people with memory issues or processing issues probably do too. Thank You SO much for the detailed posts and pictures on your DIYFish inserts! I live with PTSD, therefore struggle with being easily overwhelmed and memory issues. SO, Basically, I get overwhelmed, then forget why. 😉 Just wanted to say- Great Post!! and I’m loving your blog! I am surprised there aren’t other responses. I would love to see this on YouTube!! Love the peace prayer of St Francis, have that in mine. Thank you very much for the effort in preparing this info! I thoroughly enjoyed your DIYfish series! 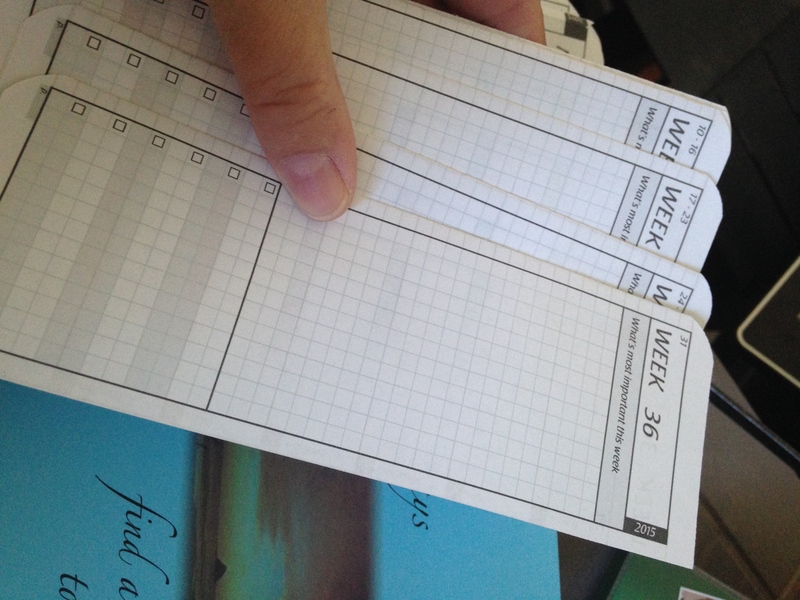 I spent a week researching the planners (and trying to figure it out to see if I wanted it) and just purchased two different sized trial planner pages today (I want to see which planner size and version I will be using more.) I liked your heads-up report of what to expect during the setup process. And your thoughts as you went through the implementation or it. I especially liked your comments on how you integrated the information into different areas of your life.